If you’ve been losing sleep wondering where Ant-Man was during the battle against Thanos in AVENGERS: INFINITY WAR, you’ll rest easy knowing that ANT-MAN AND THE WASP answers not only that question but a whole lot more. It’s now two years since the events of CAPTAIN AMERICA: CIVIL WAR and former petty criminal Scott Lang aka Ant-Man (Paul Rudd, PRINCE AVALANCHE) has been under house arrest for much of that time. He’s been making the most of it though, bonding with his young daughter, Cassie (Abby Ryder Fortson), and practicing on his electronic drum set to the sounds of The Partridge Family’s “Come On Get Happy” (which, strangely, does not feature in the film’s official soundtrack). One day, Scott has a strange dream where he’s back in the Quantum Realm and he sees Dr. Hank Pym’s (Michael Douglas, WALL STREET) wife, Janet van Dyne (Michelle Pfeiffer, MURDER ON THE ORIENT EXPRESS; MOTHER!) – the original Wasp, who got trapped in the Quantum Realm thirty years earlier after she disabled a missile that would have killed millions. Scott reaches out Pym and his daughter Hope, aka the new Wasp (Evangeline Lilly, TV’s LOST), to tell them of his dream and they interpret it that Janet is still alive and is trying to contact them through Scott. Fortunately, they’ve been hard at work over the past two years building a device to enter the Quantum Realm safely. They just need one last piece of technology, which Hope tries to purchase from restaurateur and black marketeer Sonny Burch (Walton Goggins, TOMB RAIDER; THE HATEFUL EIGHT). Sonny, however, wants in on the action as does a mysterious villain dubbed Ghost (Hannah John-Kamen, Ornela from TV’s GOT) for her ability to pass through objects, who needs Pym’s technology to save her own life. Their encounter sets off a chase and a race against time that pits not just these three groups against each other but also includes FBI agent Jimmy Woo (Randall Park, THE INTERVIEW) and his team, and Scott’s work colleagues led by his motor-mouthed pal from prison, Luis (Michael Peña, COLLATERAL BEAUTY; THE MARTIAN; AMERICAN HUSTLE). Leaving aside for half a second that this is a MARVEL film, ANT-MAN AND THE WASP is a thoroughly enjoyable sci-fi caper. It’s fun, it’s funny and it doesn’t take itself too seriously, which is a welcome relief after the dire and bloated AVENGERS: INFINITY WAR. There are some wonderful performances here starting with Rudd, who is also one of the film’s four writers. As we’ve all known since he was Phoebe Buffet‘s boyfriend on TV’s FRIENDS, Rudd is tremendously talented with impeccable comic timing. In one scene where Scott channels Janet, he does a spot-on impression of Michelle Pfeiffer, except that Scott knows he’s really Scott and so does everyone else. Equally superb is Peña, in what may be his best performance to date. If Rudd weren’t so good, everyone would say that Peña steals the film. His “truth serum” scene is the film’s highlight. He also has some great one-liners, including one involving a candy dispenser that will most certainly find its way into the vernacular. Of course, it wouldn’t be a MARVEL film without plenty of CGI and that doesn’t disappoint here. The flashback scenes showing a younger Douglas, Pfeiffer and Laurence Fishburne (who plays Pym’s ex-colleague, Dr. Bill Foster) are beyond impressive in their craft. It’s like Photoshop for Movies. Also, as it’s a MARVEL film, there are two post-credit scenes so be sure to stay right to the very end. 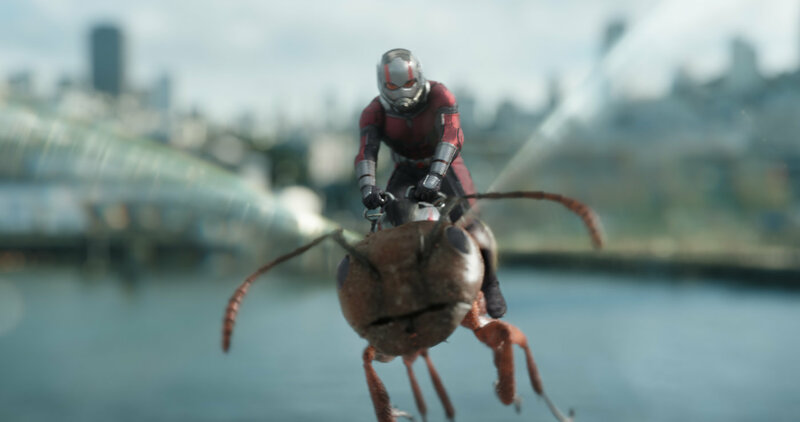 Both set up Ant-Man’s participation in next year’s AVENGERS sequel. ANT-MAN AND THE WASP is a great film for kicking off the summer of 2018. Go see it! Watch the review recorded on Facebook Live in RTHK Radio 4’s studio on Thursday, July 5th at 8:30 am HK time!